On Sunday, January 27 come down to MAC and hear veteran indigenous activist and eminent historian Gary Foley speak on contemporary indigenous struggles. 2pm start. Light snacks and refreshments available. NB. 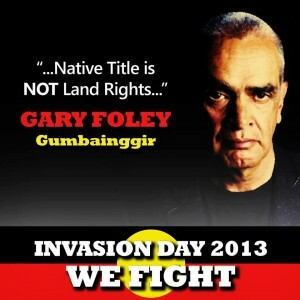 On Australia/Invasion Day (Saturday, January 26) there's a rally on Wurundjeri country at 8.30am (corner Gertrude & George Sts, Fitzroy) with a smoking ceremony and welcome to country followed by speakers and forums at 9am then a march at midday to the Treasury Gardens for the 'Share the Spirit' Festival (beginning at 1pm).